External Aquarium Filter system utilizes a multi-stage approach to filtration filtering aquarium tank water through four (4) internal layered baskets filled with assorted filter media material provides extremely thorough biological, mechanical and chemical filtration. The outlet tube is fitted with a spray-bar to help increase oxygen aeration levels within your tank. These filters are absolutely ideal for freeing-up space within your tank and provide a huge internal capacity for filter media, making them suitable for larger volume tanks. By filtering your tank using the filter media, you will observe a vastly improved level of waste-free water through extremely strong biological purification. The filter's easy-access layered filter media basket's make it simple to customize your media choices to suit your aquarium and fish livestock needs. The built in UV sterilizer exposes passing water to ultraviolet light, killing, sterilizing or otherwise irreparably damaging many micro-organisms. Your fish tank water is pumped past the UV light which is sealed inside a quartz glass sleeve which is designed to allow the maximum amount of UV to pass through the water. Maintaining the filter is very simple. 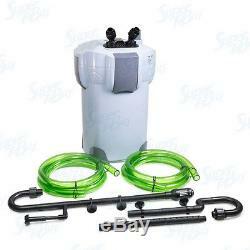 5 stage canister filter good for fish tanks up to 150 gallons. Built in 9 Watt UV sterilizer to help control algae spores/bacteria and maintain clean clear water. Output: 525 GPH (2000L/hr) Flow Rate. We Strive for 5 Star Feedback Excellent Service Is Our Goal, We strive to offer 5 Star performance in all areas of our business and want to make sure you are happy with the products and service you have received. We value every customer and will work to ensure your ultimate satisfaction. Please take the time to. So we can learn from you on ways to improve our service. Customer agrees to the following terms & conditions of this sale. Customer will do whatever possible to resolve any issues with us before leaving a bad review or opening a dispute. Customer will trouble shoot any malfunctioning items with us before returning. Unfortunately, we are unable to accommodate local pickups. Unless other was selected on the order. Buyers having APO, FPO or P. Transit time is dependent on the carrier service and cannot be guaranteed by us, sellers are not responsible for services transit time and the information provided is by the carrier and excludes weekends and holidays. This 30-Days Guarantee gives you plenty of time to check items for color, high-quality, and size. The item "525 GPH Aquarium 5-Stage External Canister Filter 9-watt UV Sterilizer" is in sale since Thursday, June 30, 2016. This item is in the category "Pet Supplies\Fish & Aquariums\Filters". The seller is "supertobuy" and is located in Los Angeles, California. This item can be shipped to United States, Canada.